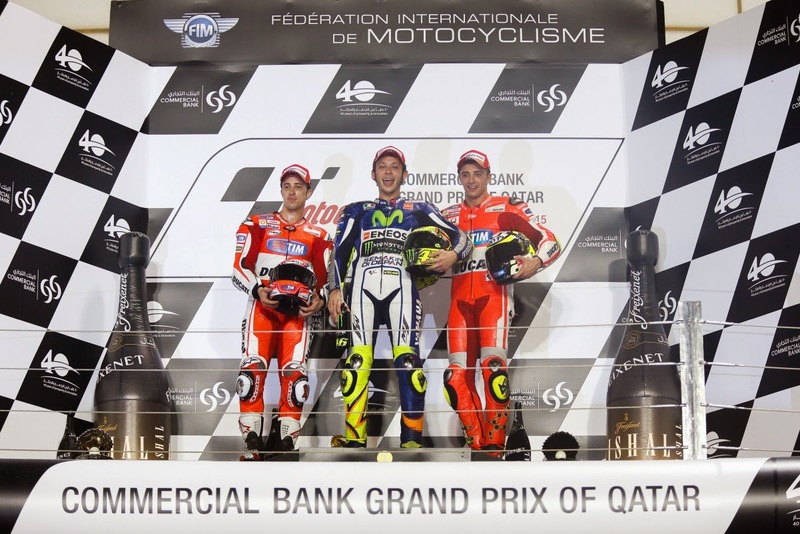 2015, The Strongest Grid in MotoGP History - The text flashed on my television screen right after all MotoGP riders were individually introduced for the opening race of MotoGP at Qatar's Losail International Circuit. The premiere class grid hasn't looked this good in years. Suzuki makes a comeback to the top class after 3 years developing their MotoGP bike. Aprilia is here as well but their races will be more of tests. Ducati has finally got their all new GP15 ready and roaring which they tested nearly a month ago. Practice and the qualifying indicate that they are ready to mix things up with Honda and Yamaha. And finally, factory Yamaha’s new M1 is equipped with the seamless gearbox enabling riders to do clutchless downshift. The first race of the season is always a special one. This is the first opportunity for the teams and the riders to see if their intensive practice sessions and testing hours in the last month or so have actually done them any good. Mostly, riders are restless and can't wait to get on the motorcycle and began real racing. The points are finally up for grabs. There are nerves and the adrenaline is as high as it can be. Fans await the start of the season with baited breaths and with similar levels of excitement and nervousness. What's going to happen and where will our favorite riders end up? Testing and practice sessions are followed religiously and the talks and the discussions are endless, circulating around the teams, the motorcycles and the riders. Speculations about the results go over the roof as we give our own expert analysis. It’s all fun. Everybody gets in the mood and everybody loves it. It is the build up to the main action. The real deal. 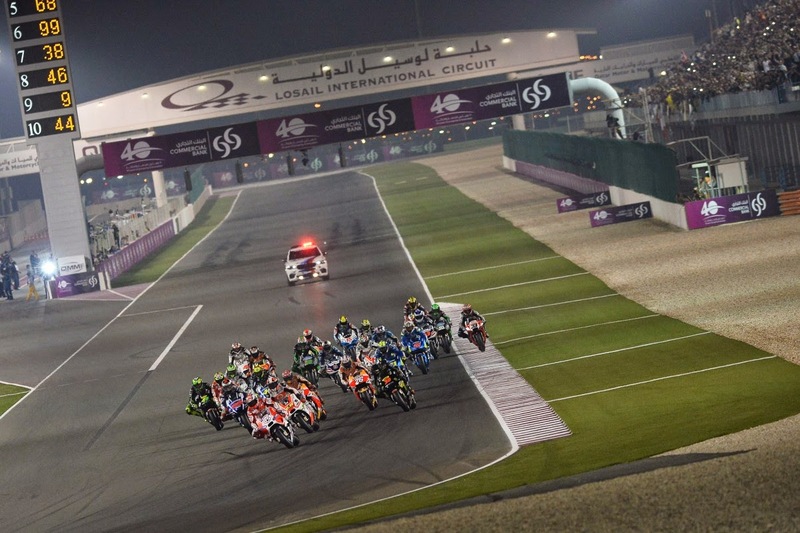 The opening round of the season takes place at the Losail International Circuit in Qatar. The only track on the calender where the racing happens in the night and under the man-made lights. The track looks beautiful especially from the helicopter shot. This year is going to be very interesting indeed. Ducati has been rubbing shoulders with Honda and Yamaha in all practice sessions consistently and in qualifying trumped both the Japanese manufacturers to take the first pole position of the season with Andrea Dovizioso. When was the last time did something of this sort happen? Ducati would be proud, they have finally been able to solve the biggest problem that their previous GP14 suffered from, the understeer (meaning that the bike was difficult to turn). The pace and performance of GP15 in the race confirms the same. Yes, we have just had the first race and there are whole 17 of them still remaining. But Ducati hasn't been this good throughout the race distance for a very long time now. It would be safe to assume that it is no longer a one lap wonder. So the Qualifying was led by Andrea Dovizioso on his brand new Ducati GP15. The race was already going to be exciting. He was joined by Honda’s Dani Pedrosa in 2nd and his team mate and current world champion Marc Marquez in 3rd. Row 2 was headed by Dovizioso’s team mate Andrea Iannone in 4th and satellite Ducati’s Yonny Hernandez in 5th. Yamaha could only manage 6th, outside of row two, as the best qualifying position with Movistar Yamaha’s Jorge Lorenzo and Valentino Rossi in 8th position on row three. Three Ducatis in top three in Qualifying, should anybody care? But then, there’s nothing more real than the race itself. That is what we wait for, that is what the riders and their teams wait for. That is what all the fitness training, practice and qualifying are all about. That is why they line up on the grid. No matter where the rider is in the Qualifying. In the end, what makes or breaks him is where he crosses the finish line on Sunday. The 22 laps race went underway with a strong line up of 25 riders. The start of the race was quite dramatic, Marc Marquez made a mistake in braking in the first corner itself and ran wide. He went wide enough that everyone got past him and he had to rejoin at the back of the pack. At the front, Dovizioso got the best start from pole and led everyone into turn one followed by Lorenzo, Iannone, Hernandez and Pedrosa. Valentino Rossi, who started from 8th, got mixed up in the tussle and was relegated to 10th by the first turn as well. He and Marc Marquez, both had their work cut out. The Spaniard, in his desperation to gain lost positions, made an aggressive move over Alvaro Bautista and hit his Aprilia while taking an inside line. The contact broke the brake line of Bautista’s front brakes eventually ending his race in the first lap itself. At the front, the battle for the lead had already begun. It seemed Lorenzo didn't want to play any waiting game with the Ducati GP15 and straightaway indulged in a dogfight with Dovizioso. Lorenzo did take the lead in the second lap from Dovizioso while Iannone, Hernandez and Pedrosa followed. Lorenzo kept the lead for few laps but from there on he and Dovizioso continuously indulged in a battle for the first position. All this time, Marquez continued to gain positions in his fight to arrive near the front runners. Valentino Rossi had similar plans as well and the way he lapped positions after positions reminded of his performance of past years. He looked unstoppable and more than once recorded fastest lap times of the race. Around half way through the race Rossi had arrived in fourth behind the trio of Iannone, Dovizioso and Lorenzo. While his progress from 10th was impressive, from this moment on it was more or less Rossi’s display of remarkable race craft. Soon enough, Rossi overtook Iannone and got in third. He had now set his eyes on the two front runners. While Rossi was aggressive, he was still patient and always waited for the right moment to attack. Never in haste. Experience and talent go hand in hand here. The GP15 of Dovizioso in particular had remarkable topend performance on the main straight. Whenever Lorenzo was in lead, Dovizioso would go past him on the main straight especially if he was near enough to take advantage of the slip stream. 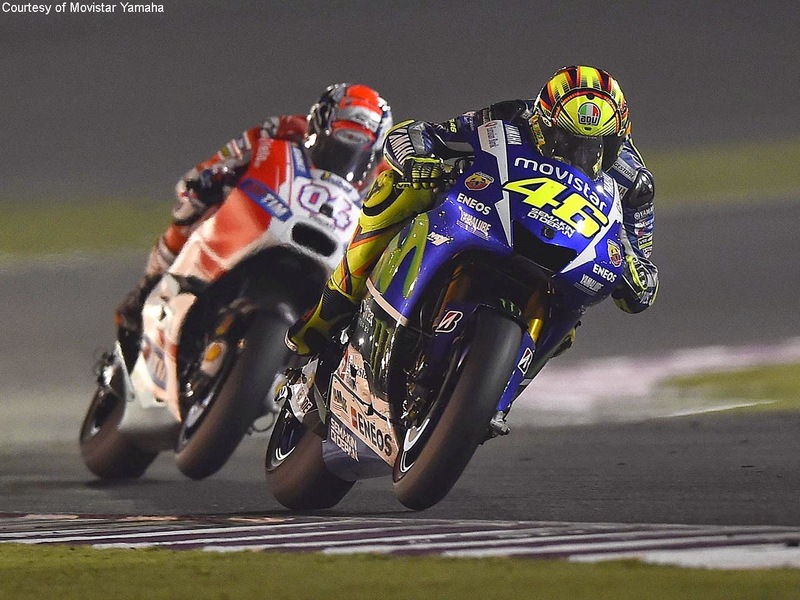 Rossi on the other hand remained close in third while not joining the battle straight away. It must be noted that Ducati is currently competing with the advantages of Open class rules meaning they have the allowance to use upto 24 litres of fuel. However, it has been known that Ducati uses 22 litres of fuel instead of full 24 litres, but it’s still 2 litres more than what factory Yamaha and Honda are allowed to use which is 20 litres. And 2 litres more fuel can make a hell lot of difference when you are trying to extract performance from each drop of fuel. This actually enables Ducati to use more power at least on the straights. While Ducati was unmatchable on the straight, Yamaha was equally impressive in corner speed. Around 4 laps to go, Dovizioso made a final move on Lorenzo and got in the lead. And soon enough, Rossi overtook his team mate as well and set his eyes on Dovizioso and his GP15. By this time, it was clear that Rossi’s overall pace was better than anybody on the track. The last three laps of the race provided one of the finest race battles between two riders. Rossi and Dovizioso swapping positions and not giving an inch to each other. Riding on the absolute limit, neither of them could have gone any faster. With two laps remaining, Dovizioso used the higher top speed of his Ducati to blew past Rossi but Rossi again managed to overtake Dovizioso in corners. The time came to again cross the finish line for the last lap and while Dovizioso managed to overtake Rossi on the straight, Rossi held him off in the first corner when the time came to slow down. Rossi is a demon on brakes and his ability to brake late and still keep his line is astounding. Throughout the last lap, Rossi kept ahead of Dovizioso and the way he was taking corners it was apparent that he was taking into account all the inches and millimeters he could save. No corner could have been taken any better. In the end, Rossi made sure that he had enough distance between himself and Dovizioso to safely take him through the finish line in first, and he did. 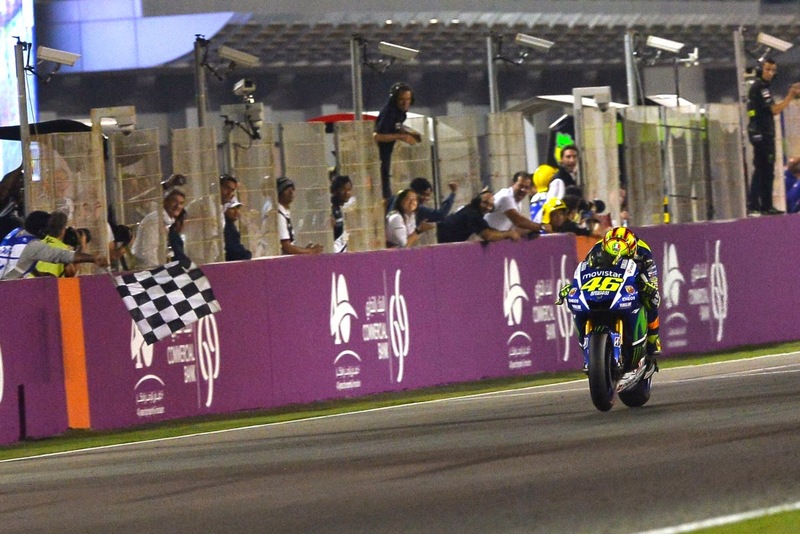 Valentino Rossi won the race ahead of Dovizioso with a gap of 0.174 seconds! What can I say that hasn't been said before? Practices were good but not perfect. And the Qualifying wasn't any encouraging either. But Rossi was still positive about his race pace, he said this after qualifying. In the end, when it mattered, the Italian legend made a perfect race. But what a day for Ducati. The way it went Dovizioso did fancy the top step of the podium but it wasn't to be his. He came second, a wonderful and hard fought second. His team mate Andrea Iannone finished third. That makes it one Yamaha of Valentino Rossi in first and two Ducatis in second and third. And an all Italian podium! What a day of racing. Lorenzo finished in a disappointing fourth. Later it was revealed that the inner padding of Lorenzo’s helmet came loose and it restricted his vision not allowing the Spaniard to fight back. Unfortunate. Dani Pedrosa finished in sixth. He later confirmed that the issue of arm pump in his forearm on the right hand is still causing serious problems and he experiences much pain during the race distance. In a sad turn of events, Dani Pedrosa will not race unless he gets this issue taken care of. We wish him all the luck that he needs to go through this. He is a fantastic racer and a sporting one at that. We need him in MotoGP. We hope that he will be back sooner than we think. The current world champion Marc Marquez finished in an impressive fifth position given that he had to fight his way back after the mistake in the first lap. On the other hand, Suzuki had a decent outing in their first race. The two Suzuki riders, Alex Espargaro and Maverick Vinales finished 11th and 14th respectively. But the race didn't end so well for Jack Miller who made his debut in the premiere class straight from 125cc! In the last lap, he hit his team mate Karel Abraham in a bid to overtake him taking himself and Karel out on the gravel. All in all, what a day (or night) of racing! As they say, that is why they line up on the grid. 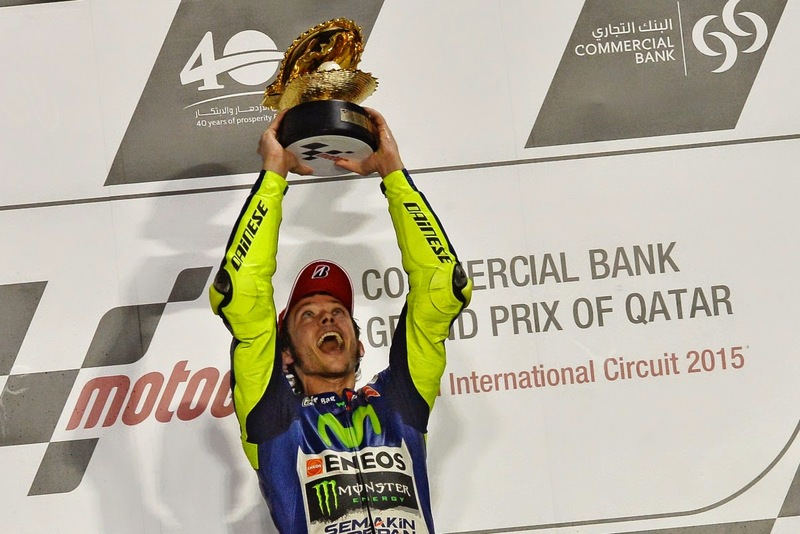 Valentino Rossi leads the championship with total of 25 points.